Created through the magic of her Fairy Godmother, the pumpkin coach plays a crucial role in carrying Cinderella to the Royal Ball where she falls in love with Prince Charming. Create an enchanting style by adding this intricate coach charm decorated with a golden crown and sparkling accents to your bracelet.This item is a single charm only. Bracelets sold seperately. Styling images may show this charm on a bracelet as styling inspiration. Disney Cinderella's Pumpkin Coach Charm is rated 4.8 out of 5 by 72. Rated 5 out of 5 by DisneyLove from Beautiful! I bought this charm while in Disney World. We got to see the carriage used in the live action Cinderella movie which was such an amazing opportunity. We also had the chance to eat at Cinderella's royal table and meet Cinderella. This charm is so meaningful to me for those reasons! I love the sparkle on the top and the hidden hearts around it. It's not a threaded charm and is an open work, but is still beautiful. 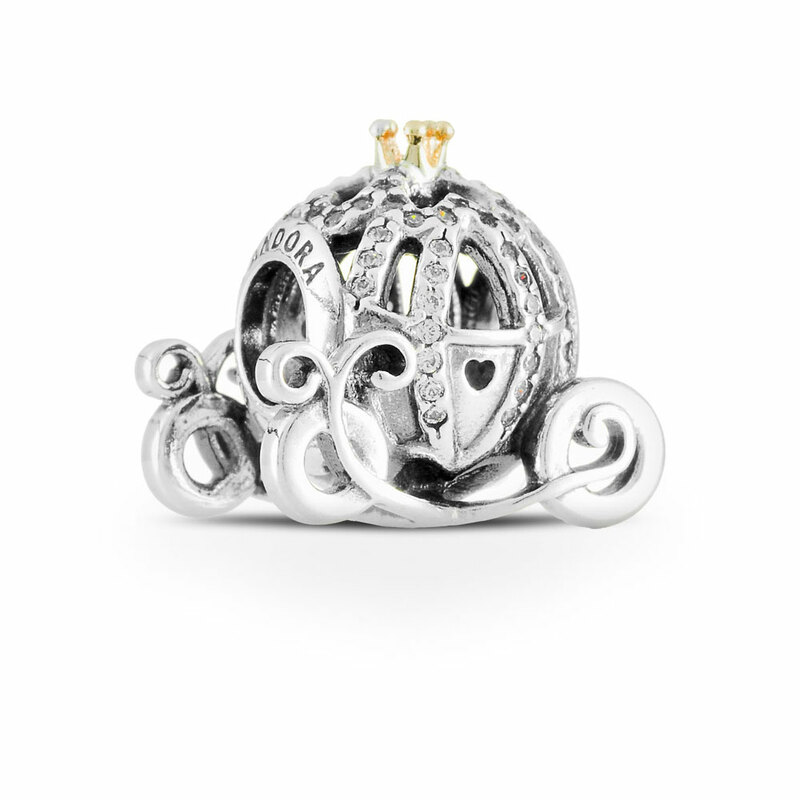 It does tend to flip upside down as many of the Pandora charms do, but overall a great buy. Definitely worth the money! Rated 5 out of 5 by Geri from She loves it!! My daughter was turning 30 and I was at a loss as to what to get. It was obviously a milestone birthday so I had to come up with something special. Ashley, the lead singer in my band, was almost 30 herself so I asked her, "What would you love more than anything to get from your dad on your birthday?" It didn't take her a half second to say Pandora!! Sorry to say, I'd never heard of you but Ashley assured me that your charms and bracelets were today's hip, stylish and chic must-have items. I took a leap of faith based on how adamant she was about that being the way to go. So, knowing that anything Disney would still hold a special place in her heart, I picked out a few Disney charms and waited to hear from her. Man oh man was Ashley ever right! She LOVED each and every one (especially Cinderella's coach and Cinderella's slipper!). By all accounts, this was the best gift I've ever given my daughter, period! Trust me when I tell you, that's saying something! I can't thank you enough for making me look so good! Rated 4 out of 5 by Polly from Beautiful piece for occasional wear got this from holiday at Disney World . The charm is beautiful the detail is beautiful and it sparkles as its covered in little tiny clear stones, however the charm doesn't sit right when its on the bracelet. I hoped it would sit sideways so the side of the coach would sit against the wrist but it doesn't the wheels do. As its a bit heavier that the other charms it drops to the underside of the wrist so when you lean against it its very uncomfortable. I also catch the crown a lot on clothes and when I'm doing my hair. Not a charm to wear all the time but nice for occasions. Rated 5 out of 5 by acr3188 from Beautiful! My husband bought this for me. It's beautiful! So much detail. Love, love, love! Rated 5 out of 5 by MCDUDZ from GORGEOUS This charm is stunning!!! I love the little details Pandora adds; the gold tip on top of the carriage, the hearts on the door, on top and underneath the carriage... The picture doesn’t do it justice! This charm was a must for me! The Cinderella carriage was our centerpiece for our wedding and is now the centerpiece of my bracelet. Rated 5 out of 5 by hrsdisneyfan2 from Such detail! I kept putting the purchase of this charm off. Sale after sale went by and still no, until the most recent one. I think it was the price point. I am so glad I finally ordered it. The charm is stunning. The animated Cinderella is one of my favorite movies so this is wonderful addition to my other Disney charms. It does roll around and around just like my other charms - it does not bother me. Rated 5 out of 5 by Cindreamer from This piece is truly Beautiful! This Charm is Very Beautiful in person! To be honest, it is pretty expensive! But a Beautiful piece! The only thing I don’t really like is that when the charm flips over, the crown digs into my wrist (ouch) but still so worth having on my charm because it gives it that vintage timeless look. My sister and I both agreed it was a must have for our Bracelets. Rated 5 out of 5 by Perfect from Perfect gift for the perfect daughter My wife and I bought this for our daughter. Absolutely gorgeous piece, pictures just can't do it justice.